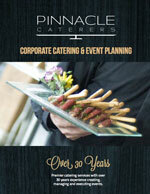 Pinnacle’s corporate catering department has been providing industry-leading food selections to the business community since 1999. Within that time we have expanded our services to include all aspects of daily catering. We offer both hot and cold breakfast, buffet and plated lunches, afternoon meetings and evening receptions. Pinnacle is constantly moving forward in its menus, ensuring that we are able to provide both trendy and satisfying meals for our clients. We always source locally first, knowing the importance of supporting and establishing partnerships with those nearest to Toronto. We are regularly updating our menus with seasonal specials, new items and selections for those with dietary challenges. Delicious food, great presentation, timely delivery and satisfied clients are what we strive for in every order. Please peruse our ‘corporate catering’ menus and place your order today!